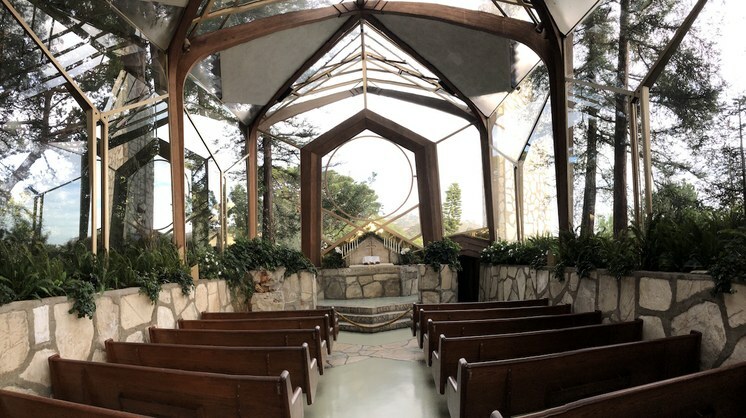 Interior of the Wayfarers Chapel built by Lloyd Wright. Rancho Palos Verdes, CA. Photo by Edward Goldman. On Thanksgiving Day, I decided to improvise, and jumped onto the 405. It felt like I was one of the few people driving South. So, there I was, in Rancho Palos Verdes, with one of the most beautiful seafront views in Southern California. A couple weeks ago, I went there to see some art exhibitions at the Palos Verdes Art Center. But on Thanksgiving, I aimed for the world-famous Wayfarers Chapel, high on the cliffs above the Pacific Ocean. 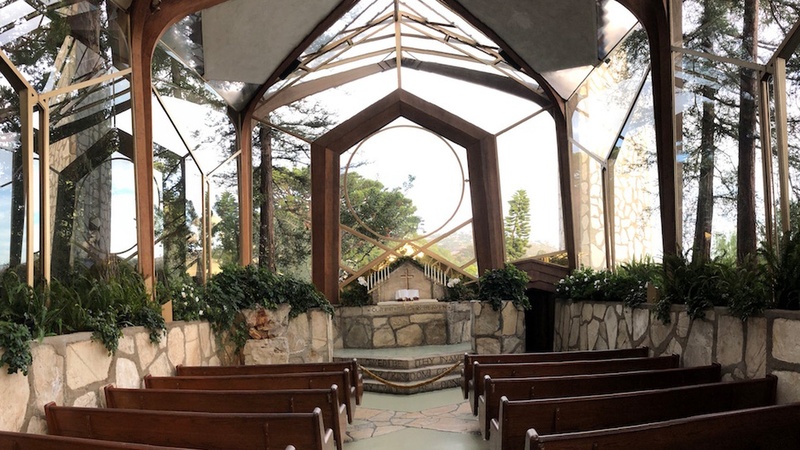 The Chapel was designed by Lloyd Wright – the son of Frank Lloyd Wright – and was built between 1949-1951. It’s listed in the National Register of Historic Places. 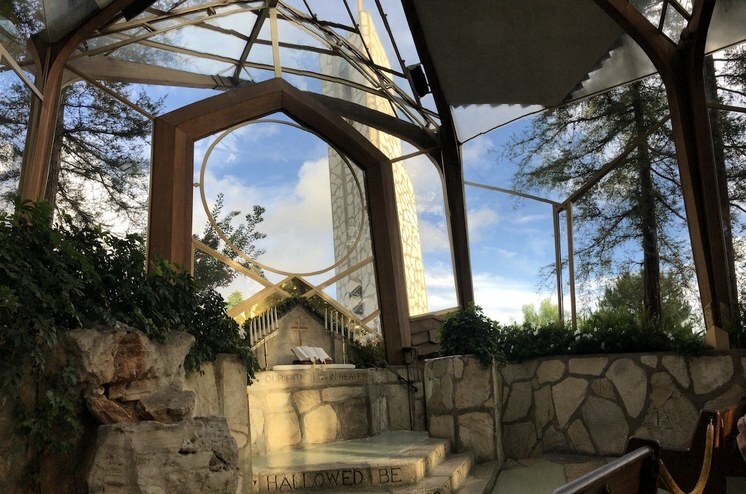 And, if you go there in the late afternoon to catch sunset, the Chapel’s elegant geometric design that incorporates views of the sky and landscape around it creates a magic moment when whatever Gods and Muses you might believe in speak to you. Usually, the Chapel is busy with weddings, but this time, it was blissfully quiet. If you haven’t been there, you simply must go. 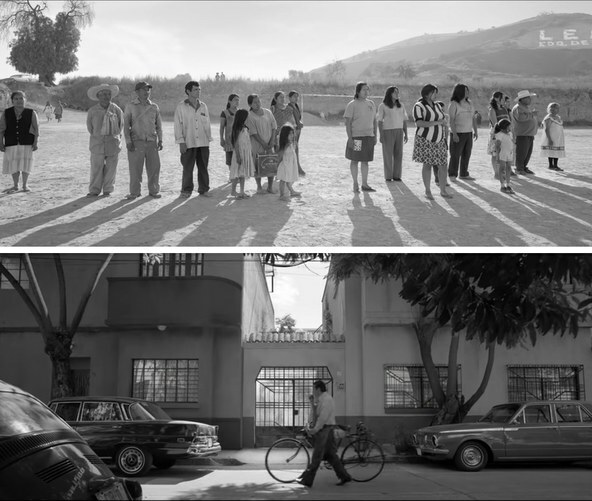 Stills from the Roma trailer. Dir: Alfonso Cuarón. Courtesy of Netflix. 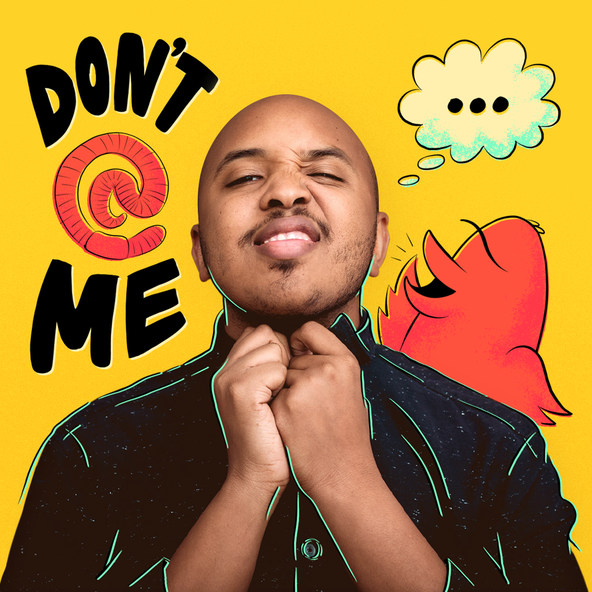 Mid-way on my drive back to LA, I stopped for dinner – shh, don’t tell anyone I had Chinese seafood instead of turkey… For the evening, I didn’t have any plans, , so I went to see a new film, Roma, written and directed by Mexican Director Alfonso Cuarón. It’s named after a district in Mexico City, “Colonia Roma,” and partially inspired by Cuarón’s childhood memories there. I swear, it took me 10 minutes before I realized that the film was in black and white – it had such refined cinematography, with a hundred gradations of grey, that I didn’t miss color at all. It’s no surprise that Roma has already won the Golden Lion at the Venice International Film Festival, and has been accepted as the Mexican entry for Best Foreign Film for the upcoming Oscars. 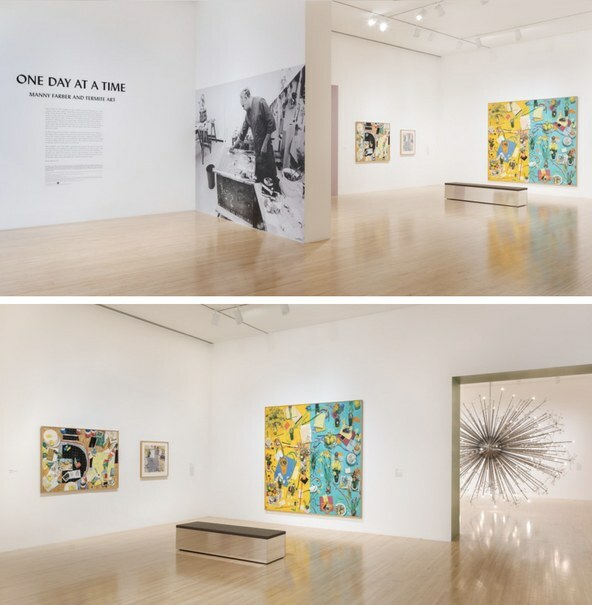 Top and Bottom - Installation shot: One Day at a Time: Manny Farber and Termite Art. MOCA. 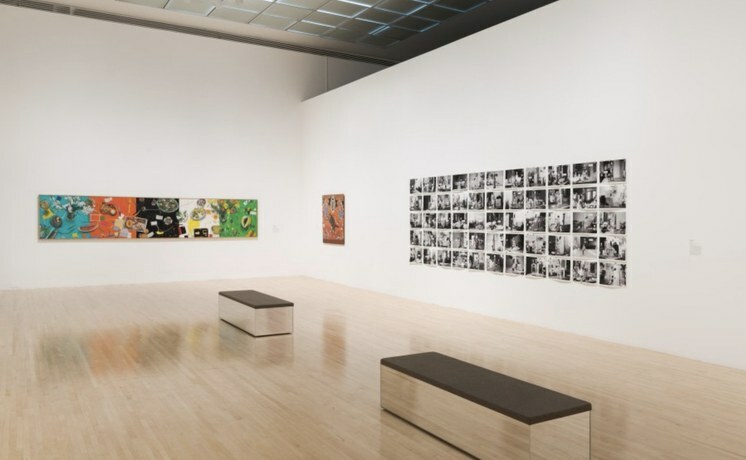 Photos courtesy MOCA. So, let me finish today’s Art Talk with a slightly unusual, adventurous museum exhibition. 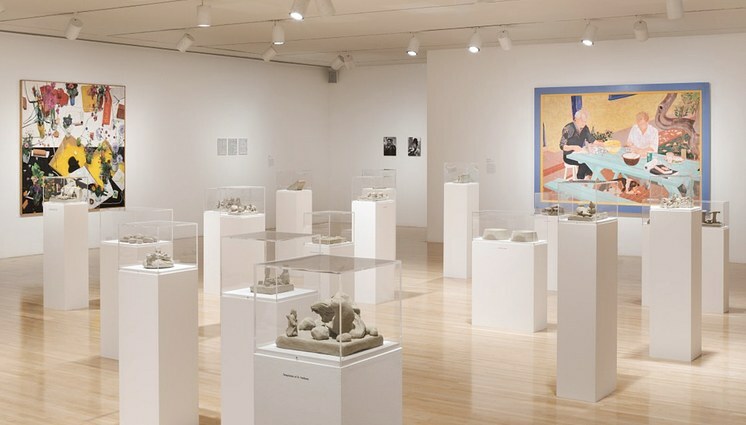 The Museum of Contemporary Art on Grand Avenue has an exhibition, "One Day at a Time: Manny Farber and Termite Art." For those of you who are movie aficionados, Manny Farber’s name will ring a bell – he was one of the most acclaimed American film critics of the mid-century. Installation shot: One Day at a Time: Manny Farber and Termite Art. MOCA. Photo courtesy MOCA. In 1977, he retired and moved to Southern California. From then on, he produced a series of paintings, collages, and drawings. His unique, trademark still-lifes show ordinary objects and food spread out on the surface of a table. When you look at them, the illusion is that all these objects are ready to fall off the table, into our space.